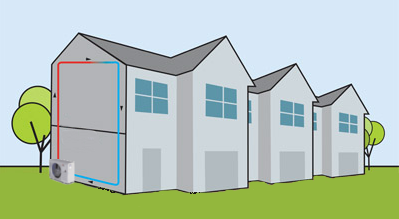 Simply put, a heat pump is a device that transfers thermal energy from one point to another. A common example of this can be found in our refrigerators where the evaporation and cooling of a liquid is used to lower the temperature of the storage compartment. Nowadays, this technology can also be used to extract the potential thermal energy in the air outside, or even from the ground, feeding it directly into your home where it is compressed and the heat transferred using a series of coils. It sounds like magic but the science behind it is relatively simple. Although they use a small amount of electricity to run, heat pumps are considered highly efficient and clean because they don’t depend on the burning of fuel to create the heat. They perform well in moderate climates such as the UK and can provide heating during the winter, even at temperatures of -20 degrees Celsius. There are different two main kinds of heat pump depending on the type of medium they extract heat from, namely air or ground/water, and they are now beginning to be incorporated into modern builds on a regular basis. Find out about the different types of heat pump here. Heat has a useful property when it comes to keeping our houses and offices warm – it moves from a high temperature to a low temperature naturally. What a heat pump does is reverse this process using some simple science that pushes air from outside, warms it up and then feeds into your house. On the outside of an air source heat pump you will find a system of coils with refrigerant in it over which the outside air is drawn using an impeller or fan. The liquid in the refrigerant coils absorbs all the heat and, because it warms up, begins to evaporate. This gas then goes through a compressor that increases the temperature dramatically. The coil then moves inside the building towards some inner coils where the heat is released. The refrigerant meanwhile flows back outside where it picks up more heat and the process starts again. The useful heat produced is pumped into air ducts and can be transported to various locations around the building or can be used to heat water that feeds into radiators. Ground source heat pumps work a little differently, getting their heat source from the ground outside or from a body of water. These systems use either closed loop for the ground or open loop piping for water. Closed loop uses a continuous supply of refrigerant to perform the same sort of action as an air source pump whilst open loops uses the water from a well or lake to do the same job. For larger scale installations, you might like to opt for an absorption heat pump which works in the same way as an air source one but uses ammonia instead of a refrigerant. These are more often found in industrial installations but recent developments have seen them being utilised for big commercial and domestic properties. 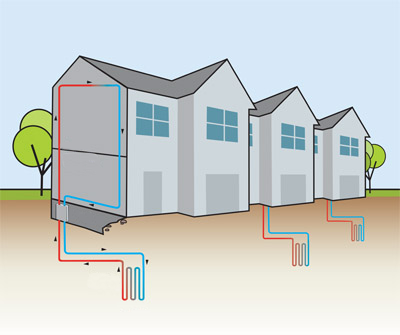 The other major component of any heat pump is the ducting that transfers the heat from the main source to the rooms in the house. The ducting is often the problem when it comes to retrofitting a house as it can be invasive and expensive to install. For this reasons, some domestic properties go for mini-split heat pumpsthat are less problematic to install. One of the newer initiatives in heat pump technology is the development of thermodynamic panels that transfer both the heat from air and solar radiation to warm up your water and rooms. These can generally be fitted on the side of a house but can also be found on the roof, looking a lot like solar panels. There are basic examples of the two main types of heat pump: air source heat pump and ground source heat pump. Whilst they are not technically renewable technologies because they depend on a little electricity from the mains, heat pumps are a highly efficient way of keeping your house or office building warm. For the UK, where the climate is fairly moderate, heat pumps can work all year round even at the lower temperatures found in our winters. The problem for older buildings is that heat is produced at a lower level than other systems which means that properties which are prone to draughts and are not properly insulated will struggle to keep the right ambient temperature. Generally, if you have the right property, a heat pump will save you money over oil or gas based heat sources. For instance, an air source heat pump could save you around £240 a year, though there are a lot variables involved, not least the type of system you choose and the kind of property you have. You can also benefit from the Renewable Heat Incentive that pays you for every kWh of heat that your pump produces (similar to the Feed in Tariff for electricity production) and you can intially take advantage of the government’s Renewable Heat Premium Payment. Find out if a heat pump is right for your property.